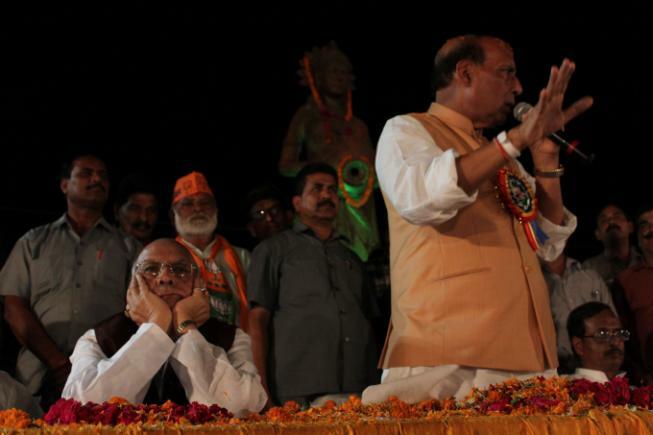 Lalji Tandon and Rajnath Singh at the Kudia Ghat meeting. Tandon, Lucknow’s current MP, has been sidelined so that Singh can contest the seat this year. On the night of 23 April, over dinner at a friend’s place in Lucknow, I was invited by Anshuman Dwivedi, a teacher at a local coaching institute, to attend a gathering at Kudia Ghat in Old Lucknow. The aim, Dwivedi said, was to pledge to protect the Gomti, the river that bisects the city. Wooing the Brahmin vote is particularly important for Rajnath Singh, who is competing against three other Brahmin candidates for the parliamentary seat in Lucknow, which non-Brahmins have won only three times in 63 years. The Brahmin community is perceived to be insecure over its marginalisation in these elections, with leaders in Uttar Pradesh and Bihar, such as Murli Manohar Joshi, Harin Pathak and Lalmuni Choubey being shifted or denied tickets, while Thakurs such as Brij Bhushan and the new entrant VK Singh are being brought to the forefront. Singh himself is a Thakur and his appearance at the Gomti gathering was an attempt to gather Brahmin support for the BJP, couched within an environmental issue. But Dwivedi insisted that his primary agenda was the environmental one. He listed some problems. “There are no water reservoirs,” he said. “Even small rains are creating big floods. Why? We are cutting the trees. So when there is a rain, there is a flood, when there is no rain, there is a drought.” He shook his head disapprovingly. Three days later I arrived at Kudia Ghat at sunset. The predominantly male audience was dressed traditionally, in white lungis and pale shirts, some with golden orange stoles. Many foreheads were streaked with red and white tilak. More men arrived and a white sheet was thrown down next to the rows of chairs to accommodate the growing number of guests. The organisers busied themselves with the statue behind the speakers’ table, a 25-foot-tall female figure supposed to represent the Gomti river, holding a tilted vessel. The crowd quieted and proceedings commenced. Dwivedi stepped to the microphone at the front podium and called out several names. A group of men—and one woman—went to sit behind the long banquet table, from which a skirted saffron tablecloth drooped to the ground. He was quickly interrupted by Dwivedi and a sadhu, who were standing beside the microphone, and who reminded him of the reason he was there. “Gomti, Gomti!” they hissed. They smiled awkwardly and several people in the audience snickered. A group of Muslim boys played in the dehydrated field near the ghat, oblivious to the entire situation. Night fell as the speeches continued, and light from the portable outdoor lamps brought in for the occasion cast a sharp glare over the ghat. The more important political guests made their appearances. The first was Lalji Tandon, Lucknow’s current MP, who has been overlooked in favour of Rajnath Singh this time, and hasn’t been given an alternative ticket. He walked slowly down the aisle to the banquet table, and sat with his hands folded before him once he reached centre stage. Then, the guest of honour appeared. Rajnath Singh walked down the aisle with his palms pressed firmly together in prayer position, as flashes went off from the waiting photographers, the light glinting off his sweaty, hairless head. When he finally reached his place at the table next to Tandon, he stood with his arms folded in front of him, silent as the flashes continued. The rituals to protect the Gomti were then quickly executed: Singh distributed garlands to the other political players at his table, lit the fire for the candles and incense sticks to be placed in front of the statue, and allowed the crowds to throw marigolds at him. He stood unblinking as the flowers hit him on the face, shoulders and chest and dropped softly to the floor, while stray petals clung to his scalp. After these formalities, Singh began his own speech, the statue of the Gomti towering behind him. “The basis of our political party is Bhartiya sanskruti,” he boomed. “The work of my life is to do work for Bharatiya sanskruti.” Applause erupted in the crowd. Though the speaker before him had invoked religion, Singh himself steered clear of any such comments, confining himself largely to charged nationalistic rhetoric. As Singh went on, Tandon appeared to lose interest. He checked his cellphone, covered his mouth with one hand and then, eventually, rested his head in his hands as he waited patiently for Singh to finish. When the summit ended, the crowd split in half. Some men rushed to snap photographs with Singh, while others raced down the steps to grab the free rations of samosa and plastic packets of buttermilk. This piece was originally published on April 30, 2014, on The Caravan Magazine. Next post:Modi’s selfie oopsie: Could a mistimed tweet change the course of India’s election?